A very quick poem. Enjoy. All those years ago at birth. If the answer you have isn’t “me”. I promised my sister a week or so to put this fundraiser on my blog. Wedding planning has been taking up my time. My darling sister, Elizabeth Rogers, has been in contact with an old school friend, Elizabeth Corser, who set up a fundraising page to raise money for a small charity, Pancreatic Cancer Action. For Elizabeth Corser, who I shall now refer to as Lizzie, it is an important charity, in that her father, David, is battling against the illness. He diagnosed with the advanced pancreatic cancer in July 2014 and given a year to live, but he has been receiving treatment and is fighting hard. I am not going to go into too much detail as I will only be repeating what is already written on Lizzie’s website, but it is great to see her being proactive. With help from her friends (one of them of course is my sister) they are running 10k at the end of May. I’m a little unsure where, however. From a personal point of view, I wish David all the best in his fight against the illness. I also send my love to Lizzie. You’re doing a great thing! It’s the season for them. I hate them. I killed one the other day which left a small drop of my blood on my bedsheets. Unfortunately the damage had already been done. There were about four volcano like lumps on my arm, with a little crater of blood in the middle. I had no guilt of killing it. I hope it’s not a mortal sin. Here’s a poem about them. Mosquitos. In the sultry dead calm of the devil’s hour. Rather than in the meadows full of fat cows and lush flowers. Though the effects of your bite fills me with fear. What you carry I haven’t got a clue. As faintly as a drop of a pin. Heartless, like a man made of tin. That lube you will not enjoy. I am hereby breaking the rules of haiku poems. I couldn’t remember the structure last night while I was having pupusas and gringas for tea. I thought it was an 8-7-8 syllable poem. Why, I don’t know. I kept playing with it and now I have no idea how many syllables it has. It turns out it should be 5-7-5. And their experiences carved in ink. I was given the idea to write this poem by a colleague. She teaches two high school students a couple of afternoons a week who struggle a little bit with their English. I taught the students a couple weeks ago while the teacher was away and I did a couple of Desert Island Disc activities (which is a great way of practising past tense; while also giving the students practice at expressing themselves). I also did a sensory poem about the sea, which I think the students enjoyed less, but it spurred the teacher to do some poetry writing on her return. 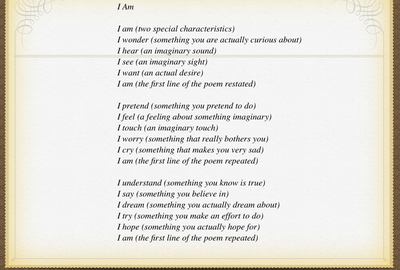 She showed them a poem structure of the “I am” poem, another great way to express yourself. So I thought I would challenge myself to write it myself. Here it is. Me laid bare! I am an impassioned yet delicate man. I wonder up adventurous yet perversely absurd thoughts. I hear words that mix my emotions in a havocking peace. I see mountains that I’m still yet to climb. I want to shred my mind from deviance. I pretend that I’m a rock star. I feel that I’m a lazy tiger. I touch my dreams yet I do everything to live them. I cry when I think of people I’m going to miss. I know that the world probably started with God. I say that science tells many truths, too. I dream I’ll be a happy, millionaire writer. I try to be popular yet not in the spotlight. I hope for peace, no matter how much a cliche it may be. This morning while going to work, Alan, who gives me a ride to work, pointed out Chiki, who’s name was pointed out on a newspaper advertisement alongside Messi. I had no idea who Chiki was, but Alan told me that she has become something of an internet sensation here by posting videos of herself doing humorous, or saying humorous things about her culture. She is a bit like a mocking video blogger, speaking from a “humble” perspective, saying that she has to straighten her hair with an iron because she’s poor and can’t afford a hair straightner. She has been mentioned on television programmes and has been picked up in the mass media. I’ll be quite honest, she speaks quite fast, so I cannot understand everything she says. I have spoken to a couple more people about her, some find her a bit naff, while others like her. Here is a copy of one of her videos nonetheless. Another video blogger who has been around for some time is Lipstickfables, a Catracha living in the USA. Maybe a bit more sophisticated than Chiki, she has done many posts about “Hondureñismos” (typically Honduran sayings), many of which are jokey and humorous, while others are about her culture in a slightly more profound tone. At the end of yesterday’s update, I told you of Eduardo Galeano’s passing. Fans of famous people often do really bad drawings of their idols and then send their portraits to their idols. At the Noel Gallagher gig I went to in 2012, there was a man with a Gallagher brother tattoo on each of his shoulder blades. While being a fan of Oasis, I can hereby say to the world that I will NOT be copying this man’s actions. 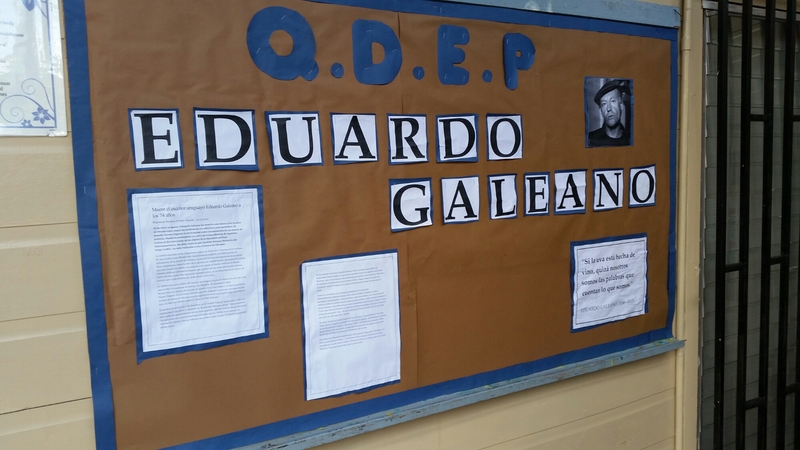 For Eduardo Galeano, however, an important author in Latin American, writer of Open Veins Of Latin America, I did this bulletin board at work. Something of an obituary. I hope he’s looking down at me with pride. If you’re wondering what QDEP means, it roughly translates as RIP.